A good piece of advice for young people embarking on their careers is to find a mentor, someone who can explain the larger context of a situation, connect them to other resources and provide individual feedback. Does this concept have any application to those with life limiting illnesses? Yes. There are well-organized support groups for many diseases which connect fellow sufferers and provide support, information and connection to resources. Until recently, no such group existed for those with Alzheimer’s or other dementia causing illnesses – caregivers, yes, but patients, no. My guess is that most people assume that someone with Alzheimer’s is no longer capable contributing to such a group. But Dementia Mentors is proving that attitude to be misinformed. 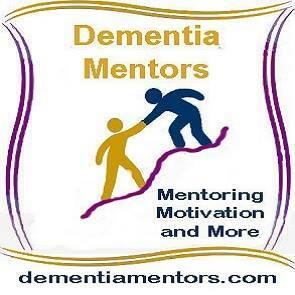 Dementia Mentors is a website designed and built by people with dementia. Launched last June, it is creating a virtual community that provides one-on-one mentoring, motivational videos, an activity page with exercises designed to keep brains exercised, and a virtual memory café. All you need to experience these offerings is a computer with a webcam. The purpose of the videos is to encourage people to think of dementia as a condition that they can live with, not a condition that will control their lives. Since much information about Alzheimer’s describes late stage disease, many newly diagnosed people can be overpowered and defeated by the thoughts of the future. The messages of these videos are ones of empowerment and encouragement, and a reminder that Alzheimer’s and other dementias are slowly progressing diseases that allow for a lot of active living. If a patient wants to connect with someone else who has a dementia diagnosis, they can do so if they have a web camera. A mentor, who has dementia, will link with the new patient and be available to discuss any questions or concerns. The ability to talk about these feelings openly and to hear from another who has the same diagnosis but who is still participating in a community and giving back is an empowering experience. Those who have the disease are best able to acknowledge the feelings of others who are coping with the same concerns and challenges. The virtual memory café is designed to provide people with the same companionship found in locally held cafés, except that it is only for the patient; there is no caregiver involvement. The organizers of the website will open up a new café when there is a large enough group in the same or similar time zone. Everyone can see each other on their webcams, so that it is a very personable experience. Someone who is a caregiver or who has experience with dementia moderates each café. The café video explains how the virtual café operates and is worth viewing. It certainly puts a new face on living with dementia. Memory cafés are just getting launched in the greater Boston area. Given the winter that we are having, a virtual café is a wonderful opportunity for those who have been house bound by the weather. Even come spring, having more opportunities to connect and share is a welcome and needed offering.